You are invited to join the more than 100 local businesses that support the charity activities of the Probus Club through sponsorship of Bike the Beach. Pay your donation by charge card. This is for Sponsors who have already signed up, but have not yet paid. Companies can sponsor rider teams. All sponsors will be named on the t-shirts distributed to Bike the Beach participants. You will be listed on our web site with a link to your web site. Placement and print size will be determined by sponsorship level. Sustaining Sponsor: $100 – All of the above benefits. Your company logo will be printed on the t-shirts distributed to all participants of Bike the Beach. 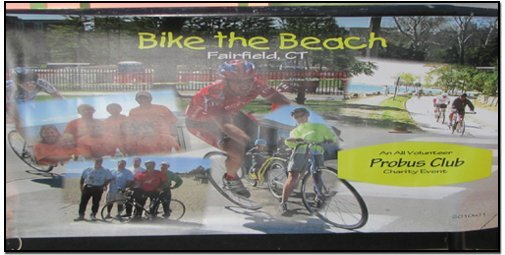 Your logo will appear on the Bike the Beach web site. Placement and print size will be determined by sponsorship level. Information about your participation as a Supporting Sponsor may be included in articles in local newspapers and other Bike the Beach publicity. One rider of your choosing will be entitled to ride in Bike the Beach free of charge. Your banner will be prominently displayed during the event. Two riders of your choosing will be entitled to ride in Bike the Beach free of charge. Sponsorship donations are tax deductible to the extent permitted by law. 2. Click the submit button at the end of the form. 3. Send us a check or use your charge card for the sponsor donation. 4. Be sure to send your logo to us at info@bikethebeach.com.